Gearshift and a Gas Pedal. 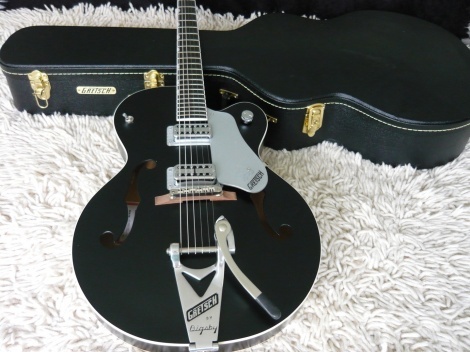 The updated Gretsch Brian Setzer Hot Rod model has been stripped down and rebuilt to Brian´s rockin´ and exacting specifications. The single-cutaway bound hollow body has an arched top, 59-style trestle bracing and f holes the two-piece maple neck has a bound ebony fingerboard with Neo Classic thumbnail inlays. Other features include dual TV Jones®-designed Hot Rod Filter'Tron™ pickups, three-position pickup switch, single master volume control, silver plexi pickguard, Sperzel® locking tuners, pinned Adjusto-Matic™ bridge and Bigsby® B6C vibrato tailpiece.